Liver resection is increasingly used for a variety of benign and malignant conditions. Despite advances in preoperative selection, surgical technique and perioperative management, posthepatectomy liver failure (PHLF) is still a leading cause of morbidity and mortality following liver resection. Given the devastating physiological consequences of PHLF and the lack of effective treatment options, identifying risk factors and preventative strategies for PHLF is paramount. In the past, a major limitation to conducting high quality research on risk factors and prevention strategies for PHLF has been the absence of a standardized definition. In this article, we describe relevant definitions for PHLF, discuss risk factors and prediction models, and review advances in liver assessment tools and PHLF prevention strategies. Liver resection is the cornerstone of treatment for many benign and malignant liver tumors. 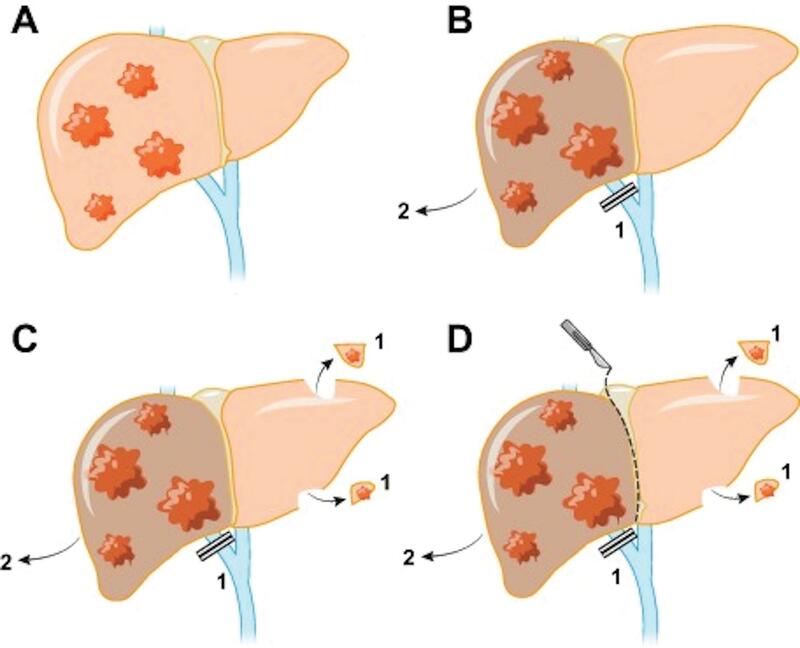 Recent advances in our understanding of liver anatomy, high-quality 3D imaging, systemic chemotherapy, and surgical technique have broadened the indications for liver resection, permitting resection of tumors that have traditionally been considered unresectable.1–3 At the same time, improvements in patient selection, future liver remnant (FLR) augmentation and perioperative care have enabled the safer application of liver surgery. Posthepatectomy liver failure (PHLF), however, remains as a major source of morbidity and mortality following major liver resection. The incidence of PHLF ranges from 1% to 34%, depending on author definition, extent of hepatic resection, and characteristics of the study population.4–6 Fortunately, a better understanding of risk factors for liver insufficiency as well as improvements in preventative strategies have resulted in a meaningful decrease in the incidence of PHLF throughout the past decade. Nevertheless, PHLF remains a dreaded complication due to its strong association with mortality and the lack of effective therapeutic options to manage it. In this article, we perform a systematic review of PHLF including recent advances in definition, risk factors and preventative strategies. A systematic review of the literature was performed utilizing MEDLINE/PubMed and Web of Science databases in July of 2017. The MESH terms “liver failure”, “liver insufficiency” and “hepatic failure” in combination with “liver surgery”, “liver resection”, “hepatectomy”, “laparoscopic liver resection” and “laparoscopic hepatectomy” were searched in the title and/or abstract. The references of relevant articles were reviewed to identify additional eligible publications. The resulting English-language articles were subsequently reviewed for relevance. In the past, the absence of a uniform definition of PHLF was the major limitation to the identification of patients at risk for liver failure-related mortality as well as effective research collaboration across institutions. Challenges to the creation of a single uniform definition of PHLF included variation in the extent of hepatic resection, discrepancies in the quality of preoperative liver function, and limited information on normal postoperative recovery of biochemical indices following liver resection. For these reasons and others, more than 50 different definitions for hepatic insufficiency have been proposed.7 In practice, the three most commonly used definitions of PHLF include the “50-50 rule”, the “peak bilirubin >7” rule and the International Study Group of Liver Surgery (ISGLS) definition (Table 1). Abbreviations: ALBI, albumin-bilirubin; INR, international normalized ratio; ISGLS, international study group for liver surgery; MELD, model for end-stage liver disease. Balzan et al.8 introduced the “50-50 criteria”, which is defined as prothrombin time (PT) <50% (international normalized ratio (INR) >1.7) and serum bilirubin >50 µ/L (>2.9 mg/dL) on postoperative day 5. In the original study, those patients who met both criteria had a 59% incidence of in-hospital mortality compared to a 1.2% risk among patients who met neither criteria. While the sensitivity and specificity of in-hospital mortality using the “50-50 criteria” was 69.6% and 97.7%, respectively, in the original cohort, subsequent validation studies have had mixed results.8–10 Later, Kim et al.11 would suggest modifying the “50-50 criteria” to a PT of <65% and bilirubin of >38 µmol/L (2.2 mg/dL) to improve sensitivity. Mullen et al.9 proposed a simplified definition of PHLF based only on a postoperative peak bilirubin of >7 mg/dL. Using a multi-institutional retrospective database of 1059 patients, peak bilirubin of >7 mg/dL was the most powerful predictor of postoperative complications, major complications, mortality and PHLF-related mortality. Indeed, the authors reported an area under the curve, sensitivity and specificity of 0.98, 93.3% and 94.3%, respectively, for predicting PHLF-related mortality. Nevertheless, subsequent analyses have had mixed results in validating the efficacy of peak bilirubin as the sole defining criteria for PHLF. While the advantage of the “50-50 criteria” and peak bilirubin >7 rule are their well-defined criteria and simplicity, agreement on a definition of PHLF that was applicable universally regardless of underlying liver function or extent of liver resection remained elusive. In 2011, the ISGLS convened a consensus conference to define PHLF as “a postoperatively acquired deterioration in the ability of the liver to maintain its synthetic, excretory, and detoxifying functions, which are characterized by an increased INR and concomitant hyperbilirubinemia on or after postoperative day 5”.7 In addition, the ISGLS also proposed a model for grading the severity of PHLF based on its impact on clinical management. The identification of factors associated with PHLF is critical for the appropriate selection of patients to undergo liver resection as well as informing strategies for prevention of PHLF and postoperative mortality. In general, risk factors can be categorized as related to: patient comorbidities, primary liver function or perioperative events (Table 2). Similarly, obesity and metabolic syndrome have been shown to be associated with higher rate of posthepatectomy complications and liver failure.19,22–24 In a retrospective analysis of 1021 patients with CRLM, obesity was independently associated with postoperative mortality (odds ratio = 1.64, 95% confidence interval: 1.13–2.38) as well as with a trend towards increased PHLF.22 Finally, Schindl et al.25 in a study of 104 patients with a normal synthetic liver function who underwent liver resection showed that a high body mass index was significantly associated with PHLF. An important contributor to underlying liver dysfunction is the hepatotoxic effect of systemic chemotherapy. Moreover, several studies have demonstrated that chemotherapy-associated liver injury is regimen-specific.38 For example, use of the topoisomerase inhibitor irinotecan has been linked to postoperative steatohepatitis, whereas use of the platinum oxaliplatin is associated with sinusoidal injury. Importantly, steatohepatitis has been independently associated with a significant increase in postoperative mortality. These findings have been corroborated by other institutional series and meta-analyses.39–41 With the increasing utilization of neoadjuvant therapy among patients undergoing liver resection, an understanding of the potential hepatotoxic effects of chemotherapy on liver function is critical. In addition to patient- and liver-related factors, issues pertaining to the surgery itself may contribute to the risk of PHLF. For example, both intraoperative blood loss and blood transfusion have been associated with PHLF.48–50 Excessive blood loss may lead to coagulopathy, hypotension and fluid shifts, which can predispose towards bacterial translocation. In addition, blood transfusion may have immunosuppressive effects. Major postoperative complications, such as biliary fistula or sepsis, may also contribute to PHLF, especially in the borderline liver or patient. It is important to note that PHLF may occur as the result of a combination of patient-, liver- and surgery-related factors such that a “second-hit” could further inhibit hepatocyte proliferation and lead to fulminant hepatic insufficiency. Since preoperative liver function is strongly associated with the incidence of PHLF and has important implications on surgical decision-making, methods of assessing baseline liver quality are critical. In general, preoperative liver function can be evaluated via a combination of traditional laboratory markers and clinical factors, liver volumetric analyses or functional tests. The ability of traditional laboratory markers, such as bilirubin, albumin, alkaline phosphatase, transaminases, PT/INR and others, to predict PHLF has been extensively reported on. While none have demonstrated perfect sensitivity and specificity by themselves, many are used in predictive scoring systems, such as the model for end-stage liver disease or Child-Pugh (Table 1). One important laboratory test not included in these scores is the platelet count. Thrombocytopenia may reflect poor synthetic capacity of the liver, underlying portal hypertension or another hematological disorder. Nevertheless, low platelet count is an important measure of liver function and predictive of PHLF.53 Likewise, preoperative imaging findings of portal hypertension including splenomegaly, ascites and gastroesophageal varices, as well as subtle signs of early cirrhosis, are indicative of significant liver dysfunction.54,55 Other traditional signs and symptoms of end-stage liver disease should be carefully noted. 99mTc-GSA scintigraphy, which utilizes an analogue ligand of asialoglycoprotein that binds to asialoglycoprotein receptors on the hepatocyte cell membrane, has recently been introduced as a sensitive indicator of the liver functional reserve; several quantitative indices from the scintigraphy have been shown to correlate with risk of PHLF. Moreover, 99mTc-GSA scintigraphy can be integrated with SPECT/CT images in order to evaluate function of the FLR which may prove more useful than volume alone.63 Likewise, the development of liver-specific contrast studies like gadoxetic acid-enhanced magnetic resonance imaging (MRI) has offered promising results in quantitative evaluation of hepatic function and are comparable to ICG R-15 and 99mTc-GSA scintigraphy.64 Costa et al.65 showed that a prediction model combining traditional clinical parameters and gadoxetic acid-enhanced MRI findings could significantly improve pre-hepatectomy risk assessment. Since FLR volume correlates with FLR function and risk of PHLF, a systematic assessment of liver volumetry during preoperative planning is critical, especially in the setting of baseline liver dysfunction or anticipated extended hemi-hepatectomy. Precise measurements of liver volume are also important given the substantial variability among patients. For example, Abdalla et al.66 found that the contributions of the right and left hemilivers to total liver volume (TLV) ranged from 49% to 82% and 17% to 49%, respectively, among 102 patients undergoing CT volumetry. Although ultrasound and 3D ultrasonography have been suggested as useful tools for volumetric assessment prior to major liver resections, their application has been somewhat limited, especially in most Western centers. Rather, CT and MRI are more universally accepted as the modalities of choice to calculate liver volume and estimate FLR. Using multidetector CT with 3D reconstruction software, the FLR volume is manually measured and then divided by the calculated TLV which is based on body surface area.67 This yields the standardized FLR, which provides an estimate of the percentage of the TLV that will remain after planned hepatic resection. Using standardized liver volumetry, guidelines have been established for minimum FLR necessary to proceed with safe hepatic resection. In general, FLR ≥20% is considered the minimum safe volume for patients with normal liver function, while ≥30% is required for patients who received hepatotoxic chemotherapy and ≥40% is deemed necessary for patients with cirrhosis.68,69 For those patients who do not meet the minimum FLR thresholds, portal vein embolization (PVE) can be used to stimulate liver hypertrophy. Given the significant risk of mortality associated with PHLF as well as limited treatment options available, prevention of PHLF remains as the primary focus of current strategies. First, all efforts should be undertaken to preserve liver function, prevent worsening of liver dysfunction, and, when possible, reverse contributing factors. For example, weight loss, control of DM, aggressive management of other comorbidities and preoperative nutritional support should be encouraged.72 Patients with chronic hepatitis should be referred to a hepatologist for treatment. Since more than 6 cycles of preoperative chemotherapy has been associated with chemotherapy-associated liver injury and worse posthepatectomy outcomes, avoidance of prolonged durations of preoperative systemic chemotherapy in patients with CRLM is prudent. Percutaneous biliary drainage of the FLR to prevent further liver atrophy and reverse jaundice should be strongly considered in hilar cholangiocarcinoma. Finally, in the postoperative setting, early recognition and intervention of complications such as postoperative hemorrhage, biliary fistula and sepsis may be important for reducing the incidence and severity of hepatic insufficiency. Fig. 1. (A) Pre-portal vein embolization of right lobe of liver to induce hypertrophy of left lobe of liver. (B) Six weeks post-portal vein embolization of right lobe of liver to induce hypertrophy of left lobe of liver. Fig. 2. Visualization of pre- or perioperative interventions and their effect on liver remnant volume. PVE is typically performed transhepatic, either via an ipsilateral or contralateral approach. A variety of embolization agents can be used including gelfoam, microspheres and coils. Usually more than 80% of patients will achieve 30–40% hypertrophy of FLR during a few weeks (4 to 6 weeks) following a successful PVE. For patients undergoing extended hepatectomy, the PVE can be extended to segment 4 in order to maximize the DH of the FLR.83 More recently, PVE has also been shown to mitigate the deleterious effects of hepatic atrophy that occur from extensive preoperative chemotherapy. Portal vein ligation (PVL), instead of PVE, is an alternative consideration at the time of first-stage procedure for patients undergoing two-stage hepatectomy, but the amount of hypertrophy in response to PVL may be inferior to well-performed PVE (Fig. 2C).84 Hepatic vein embolization is another alternative that some investigators have suggested if portal vein occlusion fails. Though not widely adopted, ipsilateral occlusion of the hepatic vein may help induce incremental hypertrophy in the setting of a “failed” portal vein occlusion (e.g. PVE or PVL). ALPPS is a novel approach to two-stage hepatectomy, in which a right PVL is combined with parenchymal transection and clearance of tumor in the FLR (Fig. 2D). The second stage is performed during the same hospitalization and involves completion of the hemi-hepatectomy. ALPPS has been associated with dramatic and rapid increases in FLR. For example, in its initial description, Schnitzbauer et al.85 reported a mean 74% increase in FLR volume over 9 days. Recent studies have reported FLR hypertrophy of 40–80% in an interval of 6–9 days following first-stage of ALPPS. Nevertheless, given that ALPPS has been associated with significant rates of postoperative morbidity and mortality and that long-term oncologic safety is still unclear, it should be used in highly selected patients by experienced providers. While it is best to avoid PHLF, some patients will develop it in the postoperative setting. The severity of the PHLF can be determined with laboratory exams, such as measurements of INR, platelets, ammonia, bilirubin and creatinine. Attempts to resuscitate the patient and avoidance of any “second-hit” complications, such as infection, are critical to provide the best chance of liver regeneration. In early stages of encephalopathy, ammonia levels should be followed and lactulose, polyethylene glycol or rifaximin used for treatment. While rescue orthotopic liver transplantation remains the most definitive treatment for PHLF, it is not universally available for many patients who develop PHLF. In conclusion, PHLF is a significant cause of morbidity and mortality among patients undergoing major liver resection. Identification of patients at risk for PHLF permits an opportunity to implement evidence-based preventative strategies. Recent improvements in our understanding of liver volumetry, functional hepatic imaging and risk scoring systems have allowed for more sophisticated and accurate preoperative risk assessment. In addition, improvements in FLR augmentation, including PVE and ALPPS, have expanded the application of major liver resection and improved its inherent safety profile. Future studies should aim to enhance understanding of the mechanisms and risk factors for PHLF, develop novel methods of improving both the volume and function of the FLR, and ultimately to develop more effective strategies for treating this challenging complication when it occurs. Conception of study objectives and/or design, collection of data, analysis of data, interpretation of findings, drafting of the article (AARA), collection of data, analysis of data, interpretation of findings, drafting of the article, revising the article for important intellectual content (JMC), conception of study objectives and/or design, interpretation of findings, revising the article for important intellectual content (SMW), collection of data, analysis of data, interpretation of findings (MD), collection of data, analysis of data, interpretation of findings (CS), collection of data, analysis of data, interpretation of findings (ERW), conception of study objectives and/or design, interpretation of findings, revising the article for important intellectual content (TMP).